Harrison was the Monster Detective, a storybook hero. Now he’s in his mid-thirties and spends most of his time popping pills and not sleeping. Stan became a minor celebrity after being partially eaten by cannibals. Barbara is haunted by unreadable messages carved upon her bones. Greta may or may not be a mass-murdering arsonist. Martin never takes of his sunglasses. Never. No one believes the extent of their horrific tales, not until they are sought out by psychotherapist Dr. Jan Sayer. What happens when these seemingly insane outcasts form a support group? Together they must discover which monsters they face are within – and which are lurking in plain sight. This isn’t a long book, but for most of its pagecount, Gregory is simply wracking up the tension, slowly, and focusing the camera ever more for the readers. That isn’t to say We Are All Completely Fine is a dull book; the dual tracks of revelation, the misdirection of our attention with the focus of the novel, and indeed the ways in which Gregory ratchets up the tension are all powerfully used. The revelations of the different traumas of the different characters, and the links between those traumas, come out slowly over the two thirds of the book, while the second (overlapping) two thirds set up and carry out the main plot, reliant on those links and traumas. This is a novel of the interstices, the blank spots, the unexplained; Gregory isn’t trying to turn something small into horror but the whole world, and We Are All Completely Fine delivers a number of moments of shivering, where the reader looks over their shoulder, sees nothing… and isn’t reassured. The characters are brilliantly archetypical. 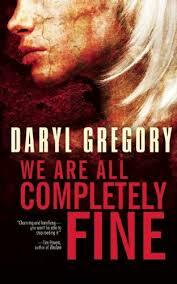 We Are All Completely Fine has the expected characters of a horror film, including the blonde, the hero, the manipulator, and the cranky paranoid one; but subverts every single one of these characters, reworks them in subtle and less-subtle ways, reveals characters as the story goes on, and generally achieves more development in less than 200 pages than some fantasy epics manage across all their volumes. It is perhaps unsurprising that a novel focused on a therapy group, with a strong sense of interiority around its characters and an interest in their personalities and interactions, is good at character; but Gregory really shows a singularly strong hand in writing distinct personalities that still somehow mesh fantastically. In part this is achieved by the combination of narratorial voices; each chapter is introduced by a first-person plural narration that never gives away who, if any specific individual, is narrating, then moving in the third-person from character to character though largely focusing on one. Gregory combines this with a sort of jigsaw of the plot, in which each character has a part of the puzzle but can’t bring them together properly, to make the novel feel at once huge and really close. We Are All Completely Fine isn’t your typical psychological horror novel, nor your typical Lovecraftian one; instead, Gregory looks at what happens next, and does so brilliantly. A really great piece of terrifying, revealing work. By Intellectus_Speculativus in Review on August 28, 2014 .